Appearance: Consistent white background with darker veins, blue and grey. 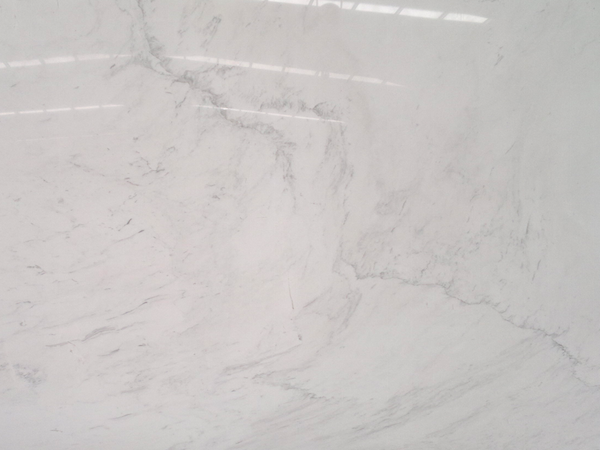 Bianco Carsico is a white and more cost-effective alternative to the traditional Bianco Statuario and Calacatta marble, with subtle and uneven veining. Properties: Colour variations and movement occur, even in the same batch. Little white stains and holes can appear with this material: this phenomenon is inherent to the stone and is to be considered part of its beauty. Bianco Carsico is sensitive to wet conditions: in such situations increased care needs to be taken and forming of stains is possible. Like all natural stone, it is recommended to seal this stone to extend its longevity. Use: Due to its good wear resistance, Bianco Carsico marble is suitable for floors and wall cladding in interiors, as well as bespoke stonework, including stairs, fireplaces, vanity tops and shower bases. Like all white marbles, it is not recommend for kitchen worktops and other surfaces subject to acid liquids (e.g. lemon juice and vinegar), which would take the shine off and cause discolouration. This phenomenon occurs with all finishes, but is more visible with a polished finish.